Because of Emily and others like her, the blog has grown its humble beginnings of David Ball reporting on the development of his new Ongoing Worlds website to the intellectual center of the simming and online role playing universe. This is where major announcements are made, this is where clubs come together, and this is where you can read the latest and greatest ideas form the best and brightest of the entire simming world. Thanks for being a part of that, Emily. Emily is now the thirteenth individual to be awarded the Community Honor since it was first created in October 2013. The award is presented by the Ongoing Worlds Board of Advisors to individuals for outstanding service to the Ongoing Worlds organization. This can be for a a variety of reasons: leading a major event like FallFest, publishing outstanding blog posts like Emily, or providing some other benefit, be it graphic design, IT support, or another service. If you think someone else is deserving of a Community Honor, please email me at star[dot]idf[at]gmail[dot]com. 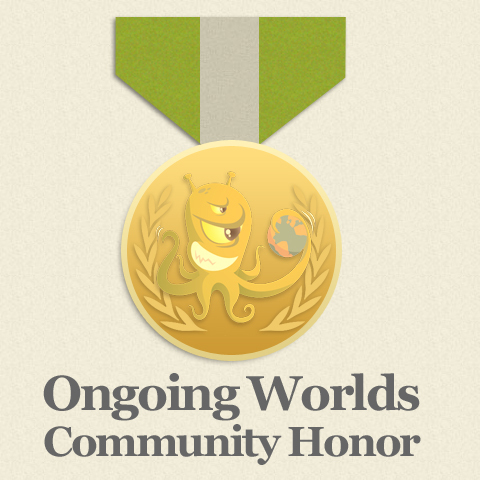 Our other major award, the Ongoing Worlds Medal for Superior Online Roleplaying (aka the Squiddies) is currently accepting nominations.